Masonry structures are constantly deteriorating primarily due to weathering effects. Over time, this damage builds up until fractures arise. Whilst these may not compromise the integrity of a structure immediately, if allowed to develop then damage may become critical. 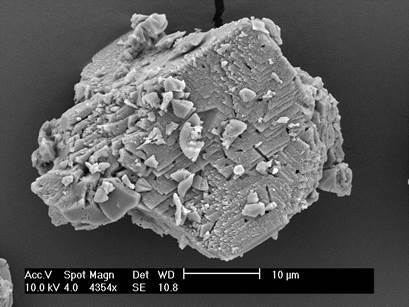 Dr Michael Harbottle and Dr Magdalini Theodoridou have recently started a new study at Cardiff University, looking at different ways that bacteria, along with precursor chemicals, can be introduced into building stone and masonry. The bacteria produce mineral deposits becoming entombed as spores in the process, alongside the chemical precursors. When damage occurs to the masonry, the deposits within the mineral will be also damaged, exposing both the bacteria and the chemicals, which interact with each other again to produce even more mineral, thus healing the damage. Dr Theodoridou’s work is funded by the European Union’s Horizon 2020 research and innovation programme under the Marie Skłodowska-Curie Individual Fellowship scheme (grant agreement no. 745891). An image showing how calcium carbonate has been precipitated by bacteria. Credit: Stefani Botusharova.